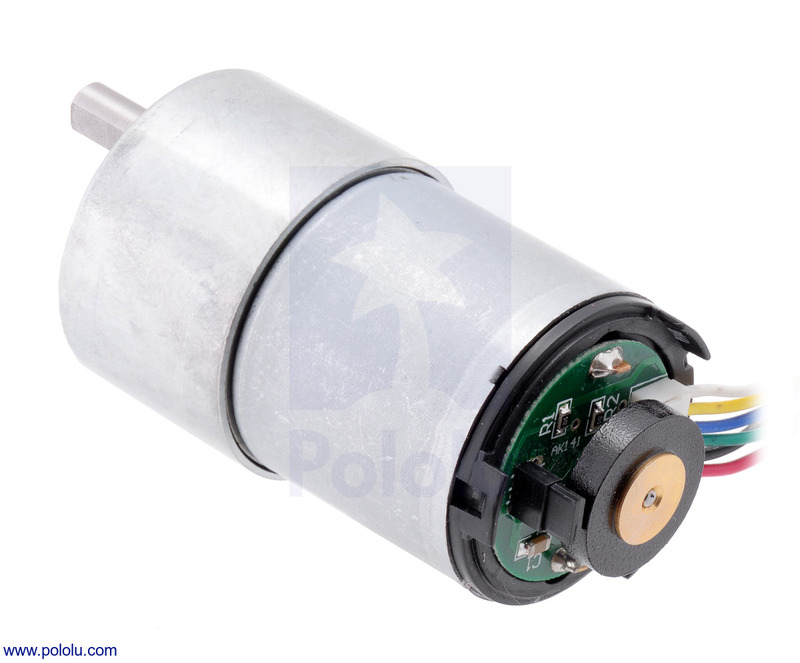 This gearmotor is a powerful 12V brushed DC motor with a 131.25:1 metal gearbox and an integrated quadrature encoder that provides a resolution of 64 counts per revolution of the motor shaft, which corresponds to 8400 counts per revolution of the gearbox's output shaft. These units have a 0.61" long, 6 mm diameter D-shaped output shaft. 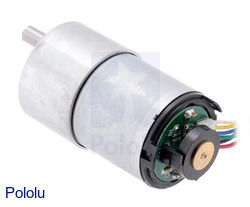 These motors are intended for use at 12 V, though these kinds of motors can run at voltages above and below the nominal voltage (they can begin rotating at voltages as low as 1 V). Lower voltages might not be practical, and higher voltages could start negatively affecting the life of the motor. The Hall sensor requires an input voltage, Vcc, between 3.5 and 20 V and draws a maximum of 10 mA. The A and B outputs are square waves from 0 V to Vcc approximately 90° out of phase. The frequency of the transitions tells you the speed of the motor, and the order of the transitions tells you the direction. By counting both the rising and falling edges of both the A and B outputs, it's possible to get 64 counts per revolution of the motor shaft. Using just a single edge of one channel results in 16 counts per revolution of the motor shaft, so the frequency of the A output in the above oscilloscope capture is 16 times the motor rotation frequency.